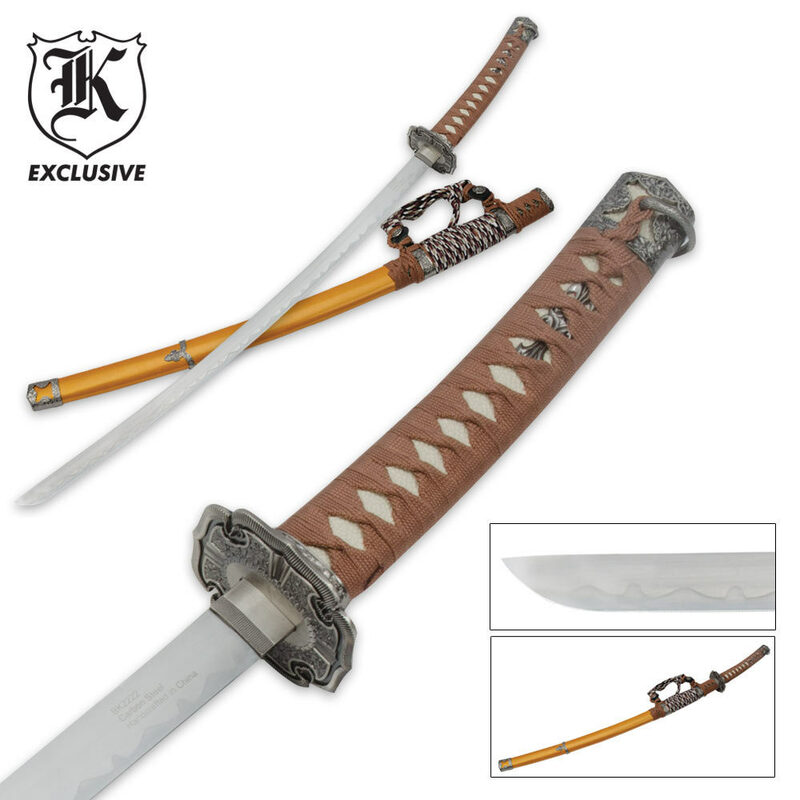 Stunning reproduction of the historical Shin Gunto, translated as ""new military sword"", which was carried by Imperial Japanese Army Officers during World War II. This katana design succeeded an earlier Japanese military sword style that was more reminiscent of saber swords. Our modern reproduction features intricate details from top to bottom. The metal tsuba (guard) is accented by matching metal fittings on the handle, pommel, and lining the scabbard. The tsuba design is unique to the Shin Gunto. The hardwood scabbard is fitted with a carry handle made of interlaced wrapping, different than that of the sword handle. A section of the scabbard is also wrapped to match the sword's handle, which has a traditional samurai wrapping with diamond pattern. Hardwood handle with earth wrapping. Hardwood scabbard with golden sun painted finish. Measurements: 26 in. blade, 39 1/2 in. overall. I just received my Golden Sun Shin Gunto today, and I have to say that this thing is gorgeous beyond belief. This is doubtless the most beautiful sword in my collection. The sageo lacing is exquisite, and is well worth the price of the sword by itself. As a matter of fact, I don't think I could buy that much lace separately for the price that True Swords is asking for this item. The complete package is just breathtakingly beautiful. The bottom metal piece and top piece(where the sword goes in)are loose and can come off the scabbard. The blade does not come sharp. Other than that it is an okay sword for the price.